VANESSA GEBBIE spent much of her childhood in Wales and can still sing hymns and swear in Welsh. Her short fiction has won many awards, including the Fish and Bridport Prizes, and has been published in the U.K., the U.S., New Zealand, Canada and India, translated into Vietnamese and Italian and broadcast by the BBC. Her teaching and facilitating has led to the publishing of anthologies of work by both the homeless and refugees in her home city of Brighton and Hove, Sussex. 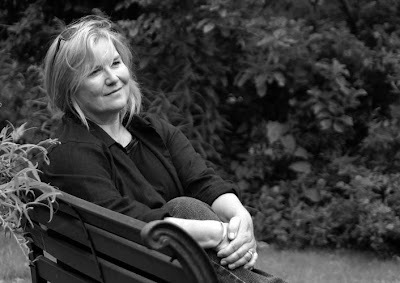 Her first book, Words from a Glass Bubble (Salt Publishing, 2008), a collection of stories, was recently longlisted for the 2008 Frank O’Connor International Short Story Award. She is at the moment hard at work on her first novel. Gebbie recently spoke to Eric Forbes and Tan May Lee in an e-mail interview from her home in Lewes, East Sussex. I found out through another blogger. Powerful, this blogosphere. I e-mailed Jen Hamilton Emery, Director of Salt Publishing, to thank the publishing house for nominating Words from a Glass Bubble. Then I sat and wondered why the other small presses do not put forward more titles. C’mon guys, it isn’t that much ... just a few books. It shows you have faith in your writers! They look a wonderful collection in themselves. I am familiar with a few. Anne Enright’s Taking Pictures is one I have read and enjoyed enormously. I love her writing, and it was a real buzz to see her reviewed alongside Words from a Glass Bubble recently in the same edition of Mslexia. I know Fifteen Tales of Modern Attraction … Alison MacLeod teaches at a university near me, we’ve met and nattered at The Small Wonder Short Story Festival. She is a great writer. I am currently reading two more collections on the list. Firstly, Jhumpa Lahiri’s Unaccustomed Earth; I’m reading this one both for pleasure and to review it for The Short Review website. Oddly enough it arrived through the post on the day I found out about the Frank O’Connor longlist. I think that was telling me something! And I have started Clare Wigfall’s collection as well … it is exciting to find so much talent in so small a space. And, of course, I am familiar with the work of all my Salt Publishing colleagues. I am lucky to be in such great company. But isn’t the award doing something good, bringing the work of writers from all over the world to the forefront, writers who might otherwise remain hidden? Good stuff. I look forward to reading the work from everyone on the list, in due course. I knew it existed, certainly. And I have bought the books of past winners. I loved both Haruki Murakami’s Blind Willow, Sleeping Woman and Yiyun Li’s A Thousand Years of Good Prayers. I have yet to read Miranda July’s No One Belongs Here More Than You, and am looking forward to a treat. I admire the way the award is set up. It is such a good thing to allow self-published collections the same chance as those with the backing of the publishing giants. We all know that getting short stories published is a tough business, and thank heavens for small independent presses like Salt Publishing. But I’d also like to think that one day the Frank O’Connor will discover or unearth a genius who has only been able to get their work out there by publishing themselves. I think of myself as a storyteller. I just write the stories down, rather than tell them out loud, and I think a great novel is just a longer story, isn’t it? I guess you can only answer this question with authority if you have written both the long and short forms, successfully, and I am in the throes of writing a long piece of work for the first time. I hesitate to call it a novel yet, as it feels more like a series of linked short stories to me. But I have to admit it is frustrating that de facto, I am not being surprised by the pieces nearly as much as when I write independent short stories. I now know the settings and the themes I have to incorporate, so no surprises there. And there is a clear thematic structure to the project, so the exploration is less ‘free.’ Writing a short story is a real joy. I love it, and am excited still by the challenge of creating a world with so very few words. The need for precision, no waste, that sense that each word has its place. I love the challenge of breathing life into a character with just a few brushstrokes. The importance of ‘voice.’ The way you, as a writer, can immerse yourself deeply in a character almost instantaneously, and if you do that, chances are the reader will, too. But (and I’m going to sound all ‘crystal-gazey’ now, and I am anything but) I think every story has its own correct form, including length, and it is the writer’s job to find it. Some stories only need 500 words, and others need 30,000. If stories find the right writer, the story will turn out close to perfect whatever its length. Think of paintings, tiny perfect miniatures versus vast canvases like Théodore Géricault’s The Raft of the Medusa, or the beautiful ceiling of the Sistine Chapel. You just can’t compare them. They are both perfect, and the subject of the miniature would look crazy spread over a white ceiling, just as the beauty of the ceiling would be lost on a tiny oval. One boring answer to the question has to be ‘time,’ but I’m sure you didn’t mean that! The stock answer is that mainstream publishers find it easier and more cost effective to back full-length work ... and are usually only willing to put money behind their short stories when the writer already has a profile. I think the truth has to be more complicated than that. I think this is really sad. It is reinforcing the notion that writing short fiction is somehow limbering up to use more words. When actually, those words may not be as exciting. That is really hard! “Light is Like Water” has to feature highly. I love magical realism and am about to study Gabriel Garcia Márquez for the research element of an M.Phil. later this year. But my favourite story will be different if you ask me again tomorrow. Whatever, it will not just be ‘more humans doing what humans do.’ As Bryan Robertson said, “Art should rise above life and not be subjugated by it,” and that’s what drives my reading and my writing, too. If I knew the answer, I’d be rich! But I think the answer might have something to do with our lifestyles, with our need to escape from freneticism more and more, and some dissonance in the messages we’re giving about the magic that can be short fiction. I do not agree, for example, that you can take a rich, layered short story and get much out of it in a snatched moment. On the contrary. A good short story rewards the reader who invests both time and thought. We often hear how the short story is supposed to ‘fit’ today’s lifestyle. But doesn’t ‘today’s lifestyle’ include a scrabble for instant fixes, instant experiences, and a certain passivity/lack of interaction with screens of all kinds? If readers approach a short story expecting an ‘instant fix,’ I don’t think they will get what they are looking for. A good short story is the setting for a three-way relationship: the writer, the words, the reader. For it to work its very real magic, all three need to be working. And the reader needs to slow down, be open, allow the words to work their magic. We hear that short stories are ideal for quick reads on the train, for example. Really? Jostling people, a hundred conversations fighting to be heard, mobile phones ringing, the tin-zizz of iPods, watching with one eye for the right stop, etc. ... how can anyone but the most disciplined readers switch themselves off enough to allow the magic to build? So they try, don’t find it satisfying, and don’t buy more. There are some terrific initiatives, Litro, for example, distributing short stories on London Underground. I am not knocking that. Any initiative designed to introduce readers to short fiction is great ... but they have to choose stories with a strong plotline, and of course, the readers can take the stories away and re-read later .... I think many readers approach a short story in the same way they would a novel ... looking for a plot, especially. Then they find that reading like this does not work … wonder what all the fuss is about, and don’t try again. For example: I was judging the Fish International One Page Story recently. The winning story is stunning: complex, layered, surprising, real breathing characters, back story and ‘future’ story, a resonance that stayed with you and bounced around in your heart for a while. I gave it to a novel-reading friend who read it, shrugged and gave it back to me. “What’s all the fuss about?” she asked. (It had won a thousand euros ...) So I asked her in return, to tell me what she thought it was about. When was it set? What was happening, why? What was the wider picture? And did the piece have any resonance for her today? She re-read slowly. Then she looked at me, and said, “How could I have missed all that? It’s extraordinary, I just didn’t see ....” I rest my case! What can we do about it? Well we can start teaching kids to read properly, for a start. Not just force-feed them partial texts for exams, texts that have little relevance for the majority. Allow them to fall in love with reading, not fight it. We can suggest people keep noise-filled moments, commuter train journeys, for their newspaper, their iPods, computers or mobile phones ... and suggest they seek peace and try slowing down when they do sit down with a good short story. Thank heavens for blogs like this, for small publishers like Salt Publishing, and for writers who are brave enough to stick with writing what they love. In the end, that love comes across, doesn’t it? There’s a depth of experience, an excitement (a punch in the gut, if you like) in the reading of a really good short story that the vast majority of novels just can’t sustain. But to get that punch you have to walk towards the fist and let it connect! Great interview, Eric. Thank you, and Vanessa for providing honest and insightful answers. I especially liked the story of the other author's response to the Fish One Page winner. Glad to know that you enjoyed the interview, Sarah! Thank you for your kind words.